Platform lifts are an effective solution for those looking to offer vertical transport in small areas. Our platform lifts in Cambridge can ease access for all visitors to your premises, and more importantly, offer safe and seamless passage for wheelchairs users or those with limited mobility. If you are looking to offer easy and efficient disabled access in your commercial or residential premises, vertical platform lifts for Cambridge offer a cost-effective, easily installed solution, that cause minimal disruption to your environment. Here at Tower Lifts we specialise in providing platform lifts that are perfect for increasing the amount of disabled access across a wide range of buildings. Wheelchair lifts offers safe and secure transport for those with limited mobility, and will blend seamlessly into their surroundings. Perfect for providing discreet and efficient transportation, our wheelchair platform lifts alleviate the need for ramps as a means of traversing steps or small flights of stairs. Here at Tower Lifts we have many years experience of providing efficient solutions for vertical transportation. 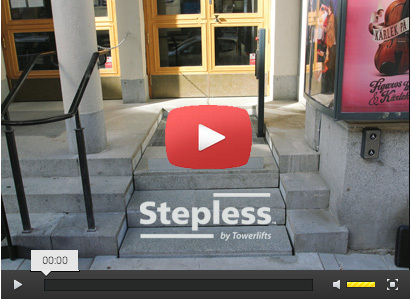 Our Stepless platform lifts are designed to lift passengers over different levels up to a maximum height of 3 metres. Vertical platform lifts for Cambridge offer a unique solution for accessing all areas of your premises. Just a few steps can prove as difficult to climb as a full stairway for visitors with limited mobility. Installing a Stepless Platform Lift offers your visitors complete freedom to roam throughout all areas and across all floors. Platform lifts in Cambridge offer a far more practical solution than traditional ramps can ever do. Installing a ramp system can be disruptive and damaging to the surrounding area. Our Stepless platform lifts also require far less space around them, as they only make use of a vertical movement. This makes them perfect for any environment where a ramp would be too steep or too long. If you live or work in a listed building you may not even be able to get permission to install a ramp, leaving disabled visitors unable to visit you. A platform lift however can be customised to suit your surroundings, and can be discreetly camouflaged to complement the surrounding decor and architecture. Our skilled and experienced team of engineers will be able to design and install the perfect disabled platform lift for your building. We believe that disabled platform lifts for Cambridge should be designed to offer easy access to all areas, without detracting from the aesthetics of the surrounding areas. If you would like to discover the benefits of a platform lift for your disabled or mobility impaired visitors, why not speak to our helpful and friendly team today. We can offer you an on-site survey as well as a tailor made quotation that matches your needs exactly. Tower Lifts are the first choice in platform lifts for Cambridge and we would be delighted to help you offer seamless, safe and secure access for all. Contact us today to book your on-site survey.